AMF, short for Actively Moving Forward®, is a national support network which connects and empowers grieving young adults. 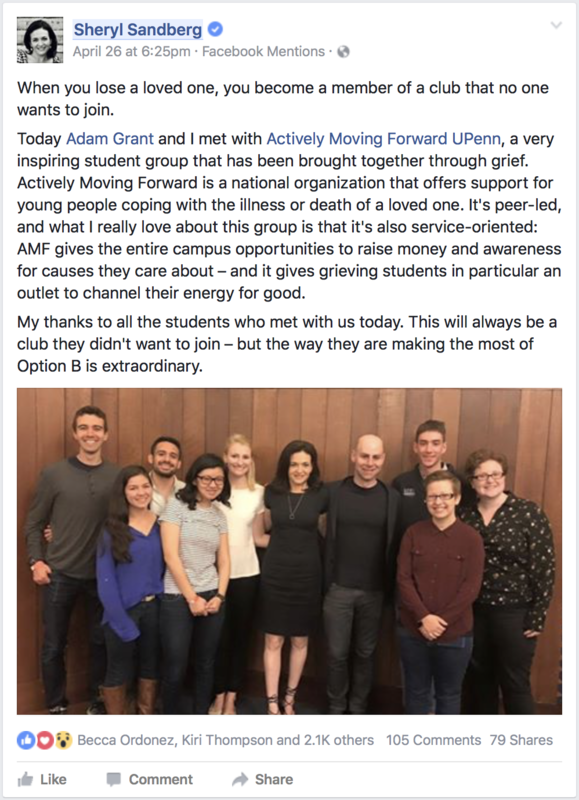 These young adults support one another with peer-led grief support groups and are encouraged to participate in community service events in memory of their loved ones. By doing so, they raise awareness about the needs of grieving young adults across the country. This program is currently actively moving forward, coast-to-coast. College grief support is essential for the grieving college student! College grief support is instrumental to a grieving college student – College students are particularly vulnerable when stricken with grief. Chances are, most students have never experienced the death of a loved one. Often, away from home for the first time, they are away from their usual support systems. Their peers don’t understand grief and therefore, these students don’t receive the empathy or support they need. With many college campuses having limited grief support resources available, these students are at high risk to a host of issues; a feeling of isolation; an inability to focus; a lack of energy; and depression. These issues can be a contributing factor to the overall dropout rate and even suicide. AMF has already supported over 3000 students on over 200 campuses throughout the United States. Some of the chapters go beyond supporting one another. Penn’s, Actively Moving Forward® chapter worked with administration to craft bereavement policies after they recognized that the lack of clear communication, on these policies, was an issue that needed to be resolved. Inquire about an existing chapter on your campus. Click here to be redirected to our inquiry form. Grief support is essential for all young adults ages 18-25! Actively Moving Forward® is a national network of young adults, ages 18-25, who are grieving a loved one’s death or a loved one’s diagnosis of a terminal illness. Our AMFer’s, as our young adults are affectionately called, are brought together because of this “thing called grief.” Together, united in grief, they bring a voice to a neglected group, themselves. AMFer’s have learned that grief is not something “to get over” nor do they need to “forget” their loved one. They have learned to embrace the memories they hold so deeply within their heart and mind and to actively move forward with that love. Through this national support network, they are empowered to transform their journey with grief into a healthy grief recovery and to AMF through life. Inquire about an existing chapter in your community. If you are a young adult ages 18-25 or an AMF alumni, we would love to have you join our virtual support group through Facebook! Join today! AMF is a contributing member for the Coalition to Support Grieving Students.